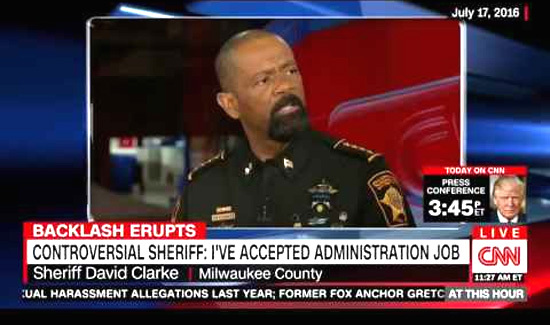 Former Milwaukee County Sheriff and current right wing activist David Clarke produces one of two reactions- usually it’s negative but the folks that like him really, really like him. “I don’t know why the gang task force invited this guy. 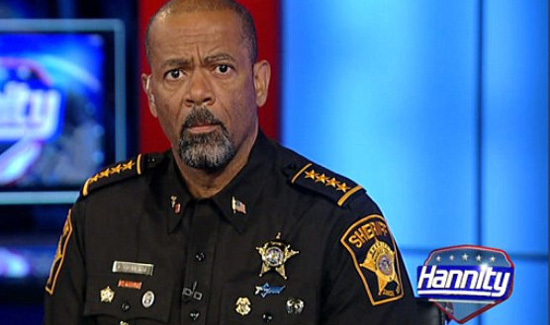 I disagree with that,” Santa Fe County Sheriff Robert Garcia told reporters about a New Mexico gang task force invitation to Clarke to speak at their annual conference. “It’s disappointing that any New Mexico organization would invite someone with such a radical disregard for civil rights and human dignity to be a keynote speaker. This invitation sends the wrong message at the wrong time, as we bring back community policing and make progress toward restoring public trust in law enforcement,” said Gil Gallegos, spokesperson for the Albuquerque PD in a statement. 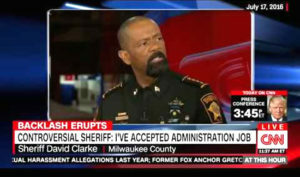 Mr. Clarke has been described as looking like the “world’s most overbearing Applebee’s manager,” due to his penchant for sporting so many military style medals. The task force explained it’s decision to invite a county jailer to speak at the gang conference.